The rules of each of the four departments set forth various standards and procedures with respect to criminal convictions and subsequent discipline; for the most part these rules amplify the statutory scheme set out in Judiciary Law §90(4). 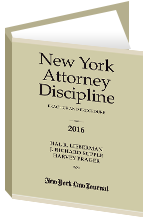 Statewide, according to recent statistics, approximately 25 percent of all public discipline imposed by the courts stem from criminal convictions of New York attorneys. Pursuant to Judiciary Law §90(4)(a), an attorney convicted of a felony under New York law, or convicted of a crime in another jurisdiction that would constitute a felony in New York, is automatically disbarred. Following conviction of a felony in any state, district, or territory of the United States, the convicted attorney must file the record of conviction with the relevant Appellate Division. Upon presentation of the record of conviction to the Appellate Division, the court shall issue an order removing the attorney’s name from the roll of “counselors and attorneys at law.” In Matter of Mitchell, the Court of Appeals-deciding an appeal taken by John Mitchell, President Richard Nixon’s Attorney General during the Watergate scandal, following Mitchell’s disbarment by the First Department-held that an attorney does not suffer a deprivation of due process by virtue of the fact that the Appellate Division disbars the attorney during the pendency of an appeal of the felony conviction which formed the basis for the disbarment. The standard the Appellate Divisions employ in order to determine if a felony committed in a foreign jurisdiction would be considered a felony in New York is whether the crime has a New York analog or is “essentially similar” to a New York felony. In making a determination of essential similarity, the court will often compare and contrast the statutory language of the underlying foreign crime with that of the purportedly analogous New York state felony. At least in the First Department, the essential similarity may be demonstrated by evidence such as admissions made under oath in the respondent’s plea allocution, or other testimony, even if the statutory language of the federal or out-of-state crime is not essentially similar to that of a New York felony. Cases where attorneys have been convicted of felonies can be subdivided into three categories: (1) New York felonies; (2) felonies committed in other states; and, (3) federal felonies. Cases involving convictions for New York felonies are the most straightforward, as they unquestionably result in disbarment. Felonies committed in other states may, but do not always, lead to automatic disbarment. Rather, our courts will assess whether the crime would be a felony if committed in New York. If the court answers in the affirmative, then the attorney will be disbarred. New York courts treat federal felonies in the same manner as felonies committed in other jurisdictions. They look for an “essentially similar” New York felony, notwithstanding that many federal criminal offenses lack specific New York analogs. For example, no New York felonies are essentially similar to the federal felonies of conspiracy to defraud the IRS, conspiracy to commit mail fraud, or conspiracy to defraud the United States. However, attorneys convicted of federal felonies that are essentially similar to New York felonies are disbarred upon conviction. An attempt, conspiracy, or solicitation of another to commit a serious crime. An attorney’s conviction of a serious crime results in immediate suspension, which generally remains in place until the Appellate Division makes a final determination as to whether to censure, suspend, or disbar the attorney. Upon a showing of good cause, however, the Appellate Division, either upon its own motion or upon application of the attorney, may “set aside such suspension when it appears consistent with the maintenance of the integrity and honesty of the profession, the protection of the public and the interest of justice.” While the attorney may show good cause as to why an immediate suspension should not be imposed, he or she may not relitigate the underlying crime. Appellate Division Rules Concerning ‘Serious Crimes.’ Although there are distinctions, the rules of each of the four Departments generally incorporate the mandates of Judiciary Law §90(4) concerning “serious crimes.” In the First Department, upon receipt of a certificate demonstrating that an attorney has been convicted of a crime, the Departmental Disciplinary Committee determines whether the offense is a “serious crime.” Section 603.12(b) of the First Department rules enumerates the crimes classified as serious; the list includes all crimes encompassed by §90(4), as well as criminal contempt of court. Upon determining that an offense constitutes a serious crime, the committee files the certificate of conviction with the Appellate Division, which then enters an order directing the committee chairperson to appoint a hearing panel, referee, or justice or judge to conduct disciplinary proceedings. The First Department rules lack a provision referring specifically to interim suspensions during the pendency of serious crime proceedings. Accordingly, the First Department may exercise its discretion as to whether an interim suspension is warranted. The Second Department’s list of serious crimes, much like that of the First Department, is largely the same as §90(4)(d); in addition, attempt, conspiracy, or solicitation of another to commit a crime involving moral turpitude qualifies as a serious crime in the Second Department. Upon receipt of a certificate that the attorney has been convicted of a serious crime, the Appellate Division refers the matter to one of the Second Department’s three grievance committees for appropriate action, or the court sua sponte institutes formal charges and refers the matter to a referee, justice, or judge for disciplinary proceedings. As in the case of the First Department, the Second Department rules have no provision for interim suspensions in serious crime cases. However, the Second Department is generally strict in its imposition of such suspensions. The Third Department rules are less specific, stating only that the court shall issue an order suspending any attorney convicted of a serious crime under §90(4), and that the attorney may apply for reinstatement upon the expiration of the period of suspension. As a practical matter, however, there are exceptions to this rule. For example, in Matter of Gray, the Appellate Division, after explaining that “the Legislature imposes automatic suspension from practice in the absence of any countervailing order by the Appellate Division” in cases where attorneys have committed serious crimes, elected not to automatically suspend an attorney convicted of two misdemeanor counts of failing to file state income tax returns, where the respondent attorney presented mitigating circumstances which included the death of his wife, the debilitating illness of his son, and various related financial problems. In the Fourth Department, the Appellate Division also suspends attorneys convicted of serious crimes under §90(4)(d) pending final disposition of the matter. Upon entry of the judgment of conviction, the court directs the attorney to show cause why a final order of discipline should not be entered. When an attorney requests a hearing, the Appellate Division refers the matter to a referee for a hearing, report, and recommendation. Upon application by the attorney and a showing of good cause, the court may vacate the interim suspension as provided for by Jud. L. §90(f). Since the category of “serious crimes” encompasses a wide spectrum of offenses, ranging from federal felonies to lesser misdemeanors, conviction of a “serious crime” can result in a broad range of sanctions. Unlike New York state felonies or foreign felonies with New York analogs which result in automatic disbarment, federal felonies without New York analogs also give rise to a range of sanctions. In some instances, the majority of which involve out-of-state or federal felony convictions, courts have disbarred attorneys for the commission of serious crimes. Conviction of other serious crimes, including federal misdemeanors, may also result in an attorney’s disbarment. Thus, the First Department in Matter of Hanna stated that the respondent’s guilty plea to the federal misdemeanor of aiding and abetting the filing of an application for alien registration containing a false statement did not limit his sanction; disbarment could result from such a conviction. Nevertheless, the court in Hanna affirmed the hearing panel’s recommendation of a three year suspension, noting that determination of the appropriate sanction should take into account all of the facts and circumstances of a particular case. On the other hand, some federal felonies result in less severe punishment. Surprisingly, although such crimes are egregious enough to be classified as felonies under federal law, many attorneys convicted of crimes in this category have received relatively short suspensions. Crimes not classified as either felonies or “serious crimes” may also result in the commencement of disciplinary proceedings, notwithstanding the absence of a statutory mandate. The rules in the First, Second, and Fourth Departments specifically provide for disciplinary action in such cases. In the First Department, if the Departmental Disciplinary Committee determines that an attorney has committed a crime that is neither a felony nor a serious crime, it may hear evidence that is not inconsistent with the essential elements of the crime for which the attorney has been convicted. In the Second Department, the Appellate Division may refer such matters to a grievance committee, or may institute formal charges and enter an order immediately referring the matter to a referee, justice, or judge to conduct a disciplinary hearing. The rules of the Third Department contain no specific procedures for attorneys who have committed crimes other than felonies or “serious crimes.” In the Fourth Department, the commission of “other crimes” results in referral to a district grievance committee for investigation and appropriate action. Unfortunately for our profession, examples abound of lawyers who engage in criminal conduct and are convicted of crimes that fall into one of the three above enumerated categories. What these lawyers may not realize is that a criminal conviction can sometimes result in even more devastation to their careers and livelihoods as a result of the subsequent disciplinary consequences. Since “guilt” cannot be relitigated, a lawyer must generally demonstrate compelling mitigating circumstances to avoid losing his or her license for what might be a lengthy period. Even more problematic for affected lawyers, conviction of a “serious crime” for those lawyers practicing in the Second Department will virtually guarantee an interim suspension, a disparity in practice compared to other Departments that may have constitutional implications, as discussed in previous columns.